Work on the VR version began in earnest after the launch of the massive Next expansion that added online multiplayer to the game last summer. 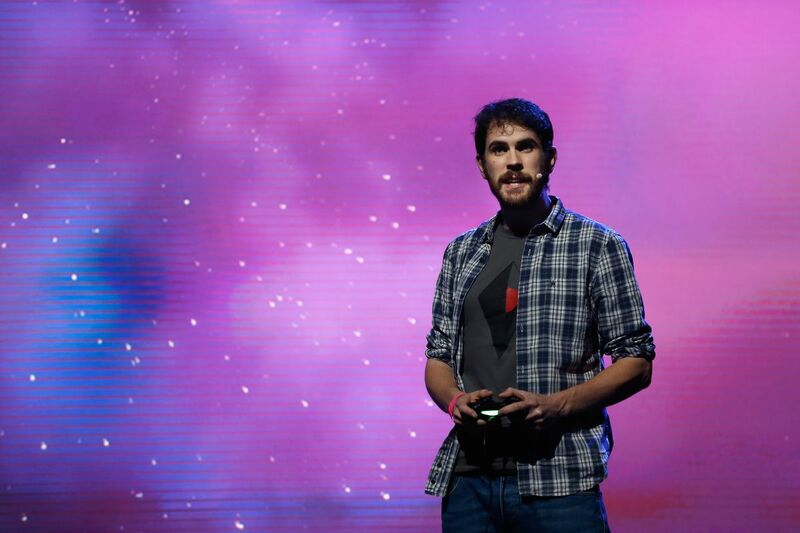 Murray says that members of the No Man’s Sky team split up into smaller teams to work on various features, which turned into things like virtual reality and a new multiplayer experience. “We started to think, these things are much better together, and we made the decision to combine them to make it more interesting,” explains Murray. I played No Man’s Sky on an HTC Vive, and the game’s alien world really comes to life when it surrounds you. Movement is handled by the now-standard teleport method, where you point where you want to go and then push a button to zap over. The game itself is exactly the same; this isn’t a separate VR mode, but the core game played in virtual reality. 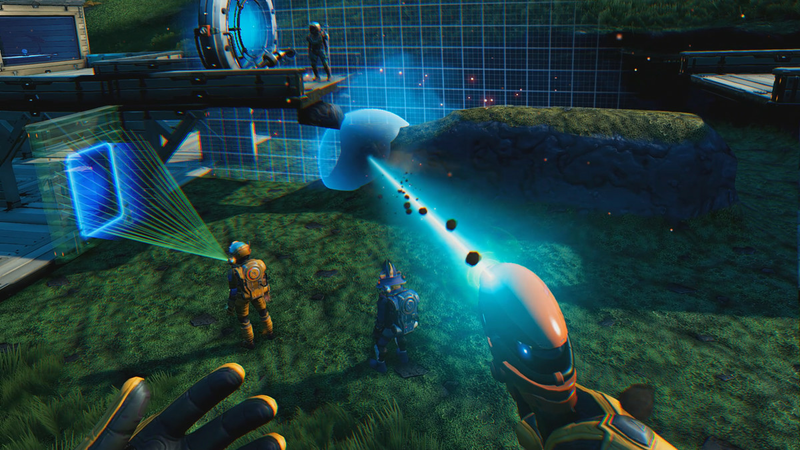 Whatever you can do in the main No Man’s Sky, you can do in VR. The most striking thing when you first start playing is how immersive it feels. Towering alien plants look massive, and venturing into a dark cave instilled a real sense of claustrophobia in me. I’m not sure if I’ve ever felt so scared playing No Man’s Sky. But the game also utilizes a number of smart interactions that really give you a sense that you’re in this space. You reach behind your back to pull out your weapon, and the menus are very cool holographic displays; hold your hand up in front of you and the menu will pop up, which you can then manipulate with your other hand. It all feels very intuitive and natural. In fact, some aspects of the game actually feel better in VR. I’ve always found building in No Man’s Sky to be a chore in the console version. It’s very tedious selecting pieces and placing them where you want them. But in VR it’s much more tactile, and the increased field of view makes it easier to craft larger structures. The same goes for piloting your ship. It can feel a bit automatic in the base game, but in virtual reality you really need to stay focused; you use one hand to push the thruster and the other to actually pilot the ship. It might get tiring for long trips, but I had a lot of fun with it during my brief time with the game. 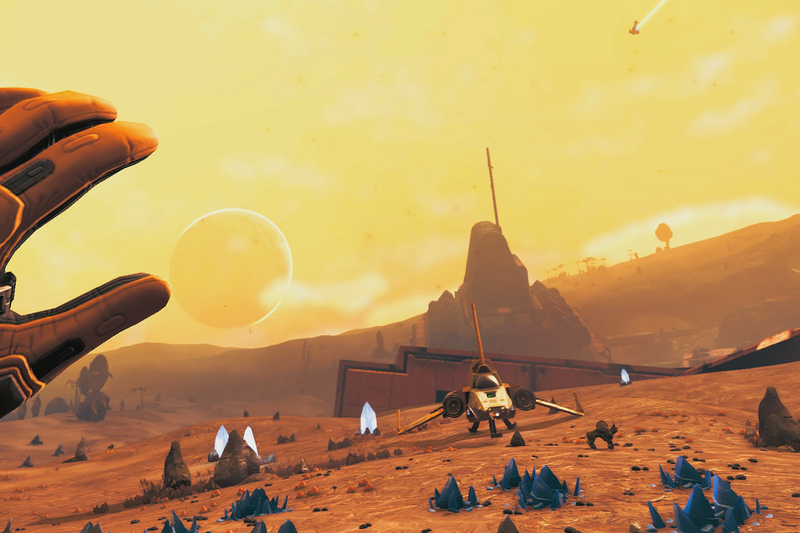 I’m not sure if I’m always going to want to play No Man’s Sky in VR. Part of the appeal, at least for me, is its meditative quality, where I can hop in for an hour or so one night and see some cool new world. But for specific moments — traveling to a new star system, designing an add-on for my base, or just venturing into the wilderness of a strange planet — I could see myself pulling out the headset.